An extension of Pi Line 22 in 5, Pi Line 27 in 6 is based on the first 27 digits of the infinite number pi. Value of the digit determines the diameter of the disc. Sequence reads top to bottom, left to right. The sequence was also used for color distribution. 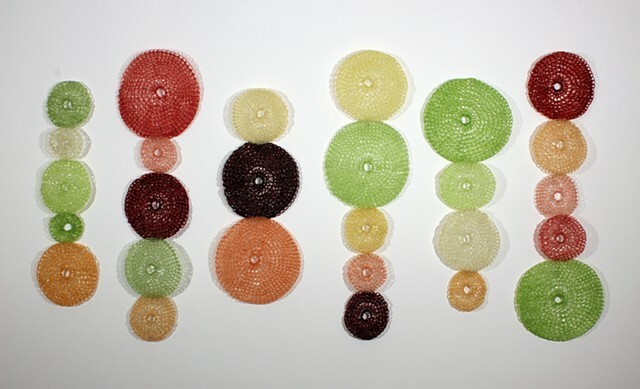 This work will hang in a Spa juice bar so colors were inspired by fruit. Construction changed the art site from a solid wall to a 4 panel space which necessitated a 6th line for a more appropriate hanging scheme.